Building a brand is critical to positioning and differentiating your organization. To attract new patients, increase physician referrals, and build business partnerships your organization must use strategic branding. A Marketer’s Guide to Brand Strategy contains valuable case studies from organizations that have experienced branding success, including The Mayo Clinic. You’ll be able to learn from their experiences and incorporate those ideas into your own brand strategy. You can also use this resource to avoid common branding misconceptions and mistakes. 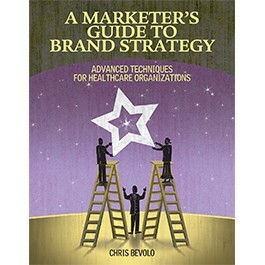 Published by HealthLeaders Media and written by healthcare branding expert Chris Bevolo, this new book provides sound business strategies to successfully brand your healthcare organization and take your branding efforts to the next level. Whether you’re a healthcare marketer, marketing director, vice president of marketing, strategic planner, or marketing consultant, A Marketer’s Guide to Brand Strategy is a must-have tool to become the healthcare provider of choice in your community. The Studer Group's Lynne Cunningham gave A Marketer’s Guide to Brand Strategy an "outstanding" rating in her monthly book review. "A very prescriptive look at how to proactively develop a brand strategy that will focus and energize your healthcare organization ...This book provides practical guidance on how—and why—the healthcare organization can—and should—take its first steps into the branding arena." Order your copy of A Marketer’s Guide to Brand Strategy today. Chris Bevolo partner and cofounder of GeigerBevolo, Inc., has more than 15 years’ experience in healthcare marketing. He has led the development of patient experience strategies, marketing and advertising plans, and branding campaigns for a variety of healthcare clients. He is a frequent keynote presenter and featured conference speaker on patient experience, branding, strategic design, and positioning for groups including the Minnesota Health Strategy Communications Network, the Wisconsin Forum for Healthcare Strategy, and others. Chris has served as a judge in local and regional design and marketing competitions and has published a number of articles and white papers. He is a member of the Minnesota Hospital Association, Minnesota Health Strategies and Communications Network, the Society for Healthcare Strategy & Market Development, and the International Association of Business Communicators.